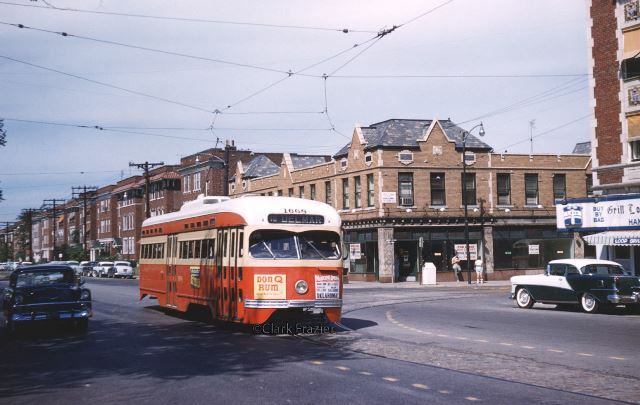 Pictured is a streetcar entering Kingsland Avenue in the Delmar Loop in 1958. The apartment buildings in the background were raised and it now is a public parking lot across the street from the University City Public Library. Ride Metro to this weekend’s 11th Annual Loop Ice Carnival, happening Saturday and Sunday in the Loop. Top features include Skating in the Sky, a half-pipe skateboarding demonstration atop the Moonrise Hotel; ice-carvers in Fitz’s parking lot; and the ice slides by Blueberry Hill.